A cute place to keep your coins. 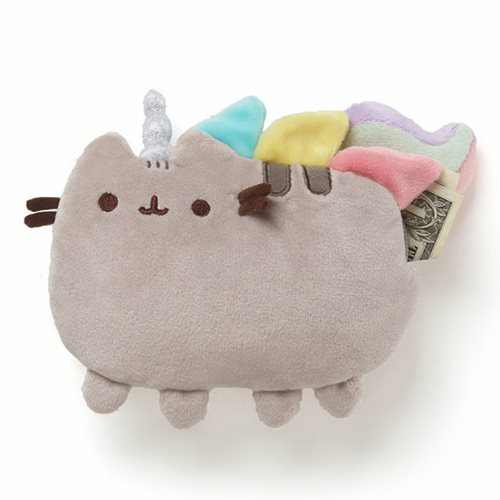 This zip-close plush coin purse brings the legendary Pusheenicorn with the multicolor mane and tail and sparkling horn to life, while providing super-cute secure storage. Made of a soft polyester blend, it's surface washable for easy cleaning and measures about 7-inches wide x 4 1/2-inches tall x 1-inch long. The inner liner of the Pusheen the Cat Pusheen Unicorn Coin Purse features a pink-and-white polka dot pattern. Ages 1 and up. Pusheen is a chubby gray tabby cat that loves cuddles, snacks, and dress-up. As a popular web comic, she brings brightness and chuckles to millions of followers in her rapidly growing online fan base. Ages 1 and up.